To provide a sense of direction for the future, this Vision Statement is a confirmation of the community’s shared values and goals, and is intended to guide future decisions. – We hold each other in high regard for our dedication, expertise, creativity, and teamwork. – We work to earn the confidence of our constituents so that they can rely on our integrity, ability, and judgment. – We like laughter that contributes to a positive and healthy environment. – We are invigorated by the work we do and demonstrate our enthusiasm to others. 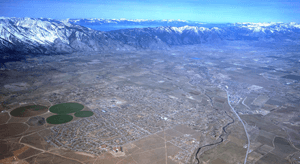 The Gardnerville Ranchos is a rural community in which a diverse population lives in harmony. The Gardnerville Ranchos General Improvement District will accommodate responsible increased development and redevelopment that is consistent with this Vision Statement. The community values and will maintain its cultural, social, ecological, and economic diversity, and will continue to maintain it. The Gardnerville Ranchos General Improvement District sees in the future considerable growth in residential and commercial construction. This construction will challenge the District's ability to balance its present rural character with future urban type growth. The District will balance this growth by acting as a steward to ensure that any type of growth will not harm the present rural character of the District. The District of the future will be a balanced community taking advantage of responsible growth to make the District a showcase community that all residents will be proud to call home.